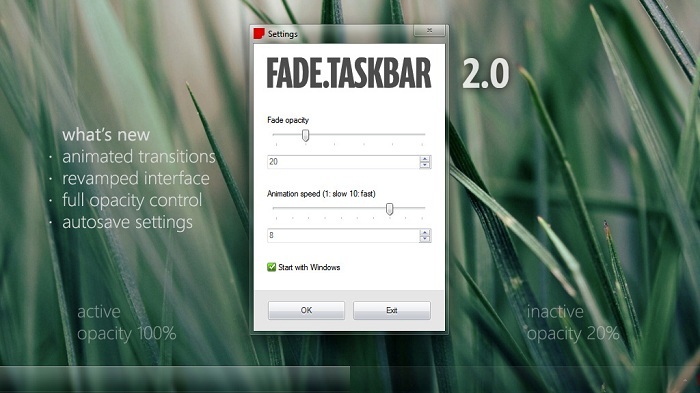 Fade Taskbar 2.0 is developed by Ritwyk. The app lets you to make the taskbar more transparent so you can see through it, yet faintly see the open application tabs. Hovering over the taskbar brings it to full opacity quickly and smoothly! It is a ZIP download, the file is very light, only 330 KB in size. This Article Has Been Shared 2790 Times! Windows 8 Start Screen is freeware for Windows XP,Windows Vista and Windows offering closest resemblance to Windows 8 like touch like scrolling by dragging. Works well on W8 Pro x64, only thing is it fades the whole taskbar, icons and all. Not that much of a problem as you can set the amount of fade just enough to see the icons when in fade mode, when you run the mouse over the taskbar the whole thing re appears anyway. Only updater I’d like to see is a way to maintain the icons, that way you coiuld set it to full clear all the time. Nice feedback. Thank you very much. Cite this article as: Abhishek Ghosh, "Fade Taskbar 2.0 – Control the transparency of Windows 7 Taskbar," in The Customize Windows, November 20, 2011, April 24, 2019, https://thecustomizewindows.com/2011/11/fade-taskbar-2-0-control-the-transparency-of-windows-7-taskbar/.